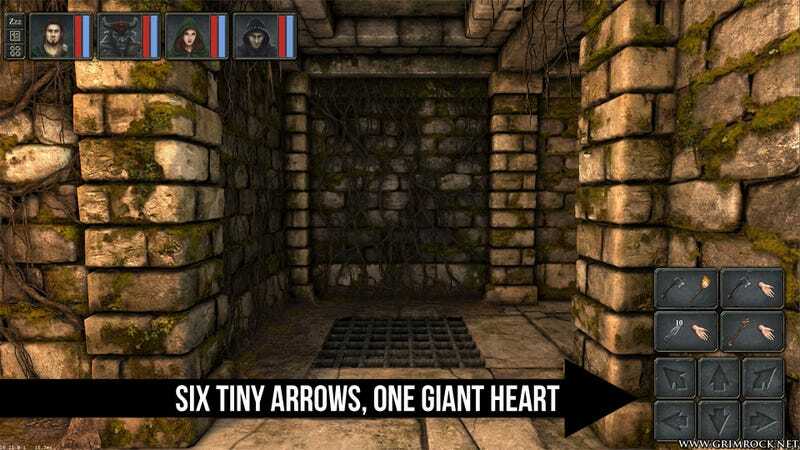 When a commenter on the website of Legend of Grimrock asked about clickable on-screen arrow navigation for the upcoming indie dungeon crawler, developers said they had no plans to implement such a feature. When they found out why the commenter asked, they quickly changed those plans. Legend of Grimrock commenter HarpoonIPA is a disabled gamer, forced to use a mouth stick for typing. Legend of Grimrock is an old-school dungeon exploration game from developer Almost Human that harkens back to games like Dungeon Hack, Eye of the Beholder, or the Wizardry series. Dungeons are tile-based, requiring only simple movements to navigate. These games often featured the option to use a mouse to click on a series of on-screen arrows, but as developer Petri Häkkinen pointed out in his initial reply to HarpoonIPA, not many people actually used them. So HarpoonIPA explained why he was asking about the arrows, and Häkkinen added them to the game immediately. That simple gesture has captured the hearts of countless Redditors, the selfless developers' actions an example of how the tiniest change can make all the difference in a person's life. You can see the full exchange in image format as it was posted to Reddit yesterday. I'd say it's also a testament to the indie game development process. If this were a big budget title with a well-known publisher, such a change could take weeks to be approved and implemented. Without such constraints Häkkinen was able to make the change without any trouble. "It was no big deal to implement it, so we thought why not do it," Häkkinen told Kotaku. "I mean, even if it would affect only the life of a single person, it is still totally worth it." The developers says his team is very humbled by the responses the story has garnered since going wide. "This was all totally unexpected." Hopefully Almost Human's kindness will translate into big numbers for Legend of Grimrock when it releases on Windows, Mac, and iOS later this year.